The decoration includes a continuous spiral that forms the edge of representations of cupids playing different games with swans, a cupid riding a dolphin, a flying swan, water fowl and an octopus. A pebble floor that adorned the circular space of a bathhouse has been uncovered in the Small Theatre in ancient Amvrakia, Arta. It was discovered during excavations by the Ephorate of Antiquities of Arta, as part of the project called “Works of enhancement and configuration of the archaeological site of the Small Theatre of Ancient Amvrakia” funded by the operational programme “Epirus 2014-2020”. 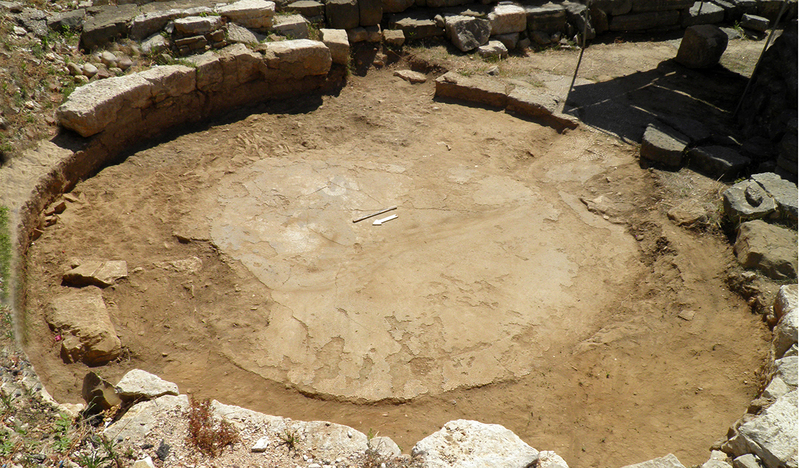 According to the announcement by the Ephorate of Antiquities, the pebble floor, on the northwest part of the theatre, has a circular shape and covers the central part of the circular space of the bathhouse which pre-existed the Small Theatre later built in the same place. It is made up of small white, yellow grey and dark coloured river pebbles and depicts scenes related to water. The decoration includes a continuous spiral that forms the edge of representations of cupids playing different games with swans, a cupid riding a dolphin, a flying swan, water fowl and an octopus. The pebble floor is linked with a similar one located in an earlier excavation in the 70s and partly covered by the east part of the Small Theatre’s koilon/auditorium. This pebble floor had been removed from the site during the 1976 excavations. 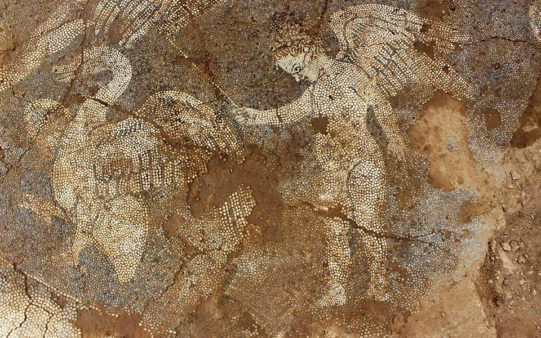 It depicts similar scenes with flying cupids, swans and dolphins and at present is in the storerooms of the Archaeological Museum of Arta. Based on the monument’s architecture and the pebble floors which resemble a similar bath complex from Ancient Corinth (The Centaur Bath), the bathhouse dates from around the mid-4th c. BC. As noted by the Ephorate of Antiquities, Arta is a town which was uninterruptedly inhabited from antiquity to the present and successive traces of previous settlements are visible in various parts of the modern urban fabric creating a palimpsest landscape of co-existing past moments and forms, projections of past settlements, as well as historical memories old and new. “The site of the Small Theatre in the town centre is now a landmark for its locals. The objective of its enhancement work is to incorporate this new archaeological site into the modern urban landscape and the daily lives of the locals” ends the announcement.